Stephen Morgan Collis was born January 30, 1818, most likely near Morganton in Burke County, to John and Hannah P. Buchanan Collis, who were married in Rutherford County on November 24, 1796. When Stephen Morgan Collis came to what is now Mitchell County is uncertain. However, we can speculate fairly accurately using a family Bible entry which says he married Mary “Polly” Sparks in 1839 along with the 1840 census showing that he and a female were living in Yancey County. Their only child, a daughter Bersheba, (Bathsheba) was likely born in 1840 and married Starling Buchanan on January 25, 1854. They had five children: Eliza Louella Buchanan Ponder Burnett, Stephen Eugene Kincaid Buchanan, Mary Jane Buchanan Freeman, Sarah Ella Buchanan Birchfield and the last, John Buchanan, in 1867, the year in which Bersheba died, perhaps in childbirth, although no evidence to support this has been discovered. Stephen and Polly took in the Buchanan children and raised them with no currently available backstory as to why they did not stay with their father who married a second wife October 10, 1867. When the Roan Mountain Baptist Association (now Mitchell Baptist Association) was formed at Double Island Church in Yancey County on October 5, 1849, Collis was elected the first Clerk. He served as Clerk of the Association for 10 years and as Moderator for 19 years, serving for the last time in 1887. In 1866 he was elected Clerk of Superior Court of Mitchell County and in 1874 he was Postmaster at Micaville. His influence was incredible. He was given the task in 1855 of increasing Sunday Schools in the affiliated churches, which indicated having 1 at the time; by 1869 all of the churches had Sunday Schools ranging in attendance from 33 to over 100. He was a tireless worker. 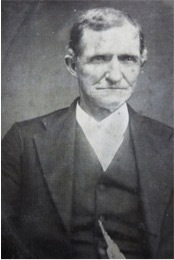 For example, in 1865 he reported to the Association he had preached 114 sermons, given 115 exhortations, baptized 177 individuals, and received 284 people into the churches. Similar reports from various sources are recorded in subsequent years. According to Polly’s pension record, Stephen served in the Union Army as Chaplain to the Tennessee 13thCalvary. 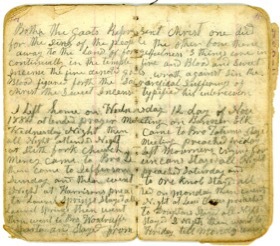 As an Itinerant Evangelist with a Bible and a hymnbook in his saddle bags, he rode his horse “John the Baptist” up and down hollows and hills looking for the lost, finding many, and baptizing them in nearby creeks and rivers. In one diary entry he reports that in July 1884 he was out riding for 29 days, preached 20 sermons, and visited 11 families. On the day before his death he had preached at Grassy Creek and “seemed to be his usual vigorous self.” He died April 16, 1890, at 72. Rev. Collis rests beside Polly and Bersheba in the sinfully neglected Penland Cemetery overlooking the town of Bakersville.